Are you looking for a truly special gift for Dad? One that goes beyond the book on WWII, the trendy wallet or new tie? Below are 3 great Gifts for Dad that come from the heart and are certain to touch him deeply. Ranging in time and cost, these gifts for Dad can be given individually or collectively as a family and are all gifts he will find truly special. Does Dad have a favorite photo tucked away somewhere? Of him as a young boy? Of his parents or grandparents? Of him with his sibling? If the photo is in poor condition or too small to display, have it digitally restored, enlarged and reprinted on archival paper. The frame it. When presenting the framed photo as a gift, be sure to ask him to share the story behind it! Take a leisurely drive or stroll through the neighborhood where Dad grew up and let him recount his memories. If the whole family comes along, rent a van and hand out a written itinerary with the history and highlights. Enjoy a meal at his favorite neighborhood restaurant to cap off the special day. For a truly special gift for Dad, capture his life story, family history and memories in a book, on audio tape or in a Video Biography. You can either do it yourself or hire a professional. Either way, knowing his story will be shared for years to come, is a gift guaranteed to move him deeply. Post your great gift idea in the comment section below so others can discover more great gifts for Dad! Give your parent or grandparent the gift of a lifetime by capturing their life story – in their own words – for your family to know and cherish. Here at Family Line Video, we produce Legacy Videos, modern-day memoirs that weave filmed interviews together with family photos, documents, maps and other memorabilia. The result is a beautiful ‘Moving Portrait’ of your loved recounting their life story and memories – a gift your family will treasure for years to come. Your stories are too important to leave to memory. 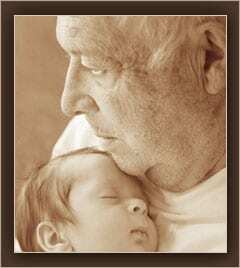 Preserve them today for your children, grandchildren and generations beyond.